A discussion with David Clark (Labour) and Metiria Turei (Greens), two locally based Members of Parliament. The event was organised by the Otago Energy Research Centre, the Centre for Sustainability, and the Otago Climate Change Network. This is the first duet by Clark and Turei in the 2014 elections. They are singing from the same song sheet. Despite the differences between their parties’ agendas, which are minor notes, there was plenty of affection and respect between both speakers. The big debates are yet to come. Other parties who could have represented a different view voted with their feet and stayed away. We risk a sea-change of 1.6 metres. I’m a couple of centimetres over 1.5 metres so that is getting personal. It affects our harbourside, and South Dunedin, an area of the city for people who can’t afford to move, and often can’t afford to own their own property. Inequality makes our poorest citizens most vulnerable. The delay in taking action on climate change is a luxury we can’t afford. The longer we wait the more we will have to pay. The small scale of our nation doesn’t stop us from becoming world leaders: it’s not the size of the country in the fight, it’s the size of the fight in the country. So let’s take a can-do attitude. Labour introduced a Carbon Emissions Trading Scheme and is continuing to push it. National cannot get out of the scheme. Iwi have invested in it. Business is taking an interest and responding well to it. Under a change in government it has become a protection for pollutors. The loop-holes need to be tightened up. The Greens would like to change it for the alternative, a Carbon Tax. This will take time to implement. Another three years of the current government will continue in an increase of emissions and environmental degredation. It is central government that can respond better. This is why the opposition parties advocate for a change of government. There are some companies who don’t care. Time to hunt them down and hurt them in the wallet, that will cause them the most pain. There is a shift in thinking in the last ten years. This will continue to develop. A lot of people want to make a better choice. As more wealthier households go off the power grid for supply (more solar energy) the stress of maintaining supply shifts onto poorer households. That’s 50% of the population, the Middle New Zealand. Change will be supported out of our taxes. David Clark gets to talk. A debate hosted by the National Centre for Peace and Conflict Studies at the University of Otago. Labour Party politicians David Clark and Marion Hobbs spoke for the affirmative; university lecturers Richard Jackson and Bryce Edwards spoke for the negative. The debate was chaired by Kevin Clements. Politicians are in it for their own gain. They become a political caste, serving their own interests. They would tell us that our democracy is funded on raffles. Voting is a civic sacrament and we should all worship it. If voting mattered it would be illegal (I think that that is a quote from Mark Twain). New Zealand has a democracy where real change is possible and voting matters. We have healthcare, education, roads and the rule of law. At the same time voting cannot meet the challenge of climate change and inequality. Our electoral cycle is limited to three years, when we are offered the choice of accelerated neo-liberalism or neo-liberalism in soft focus: vote the bastards out or keep them in for another three years. Until the option of voting the right lizard in is made to us again in the next electoral cycle we remain apathetic to what they do. So long as we get some jam with our tea. So the voter has no power, no option, except the status quo, and special interests have better access to our politicians than the average voter. The politicians imagine that they have been given a mandate while the voters remain alienated. Democratic institutions have lost control of neo-liberal capitalism. Democracy is under threat to the oligarchy (the 1%ligarchy?). It has become a celebrity contest, about personalities and not issues. So we need to stay informed, to stay involved, to remain interested. It’s up to you. It’s your choice if you don’t vote. The system is broken. Say no to business as usual. Don’t endorse what you don’t believe in. Change will be made by politics on the street. If you do vote then don’t complain; you voted them in! Like the churches, and the sports clubs, and the voluntary organisations, the political parties are running on a smaller group of people. We are not interested in joining up. It’s a smaller group of people who are making policy for the rest of us. Final questions: Is the neo-liberal project over, like the politicians would tell us? Is there an alternative to voting by taking the initiative, being involved and being informed? What if voting impeeds progress? What if we can’t move to a no-growth economic system? Despite the argument a vote of hands made it clear that the majority of the audience intended to vote in the September election. The chair declared that the ayes had it. Questions from the floor made it clear that the audience wanted to hear more about the alternatives to voting: Be involved; be engaged; be informed; be aware; learn about alternatives; question; create community. I was glad to be part of this audience. It was well attended and the lecture theatre was full. We are closing our borders to migrant Pacifica refugees who want to escape the loss of island nations to global climate change to come to New Zealand. In 15 years, about half a generation, 1 in 4 human beings will be living in metropolises. Many of theses will be Blade Runner-esque mega-cities. They risk being zombie towns: lurching forward, but economically dead. The sixth great extinction of world history is now underway at the hands of human beings. Natural sound has been archived, some of which cannot be reduced in the wild now. The chorus of life praising the creator is systematically killed off. God may have words with us over that: Wait, after doing that to your first planet, you expect a free pass to my new creation?! Nature is unconscious to our depredation. There is no negotiation as we exploit nature. It is supine. There will be no negotiation with nature as it changes on us. We live in a closed system. Advocates of the market place policies argue we must adapt. That could prove a rather harsh adaption when the time comes. Our fantasy, our utopia, may be to image we could return to a pre-scarcity society. We have become so alienated from place we are talking to each other through remote access, each one of us in our own private cubicules. Detachment is at the heart of greed. We want to engage with the simulacrum, not the immediate person. Our finances have become abstract, numbers on a screen. Our place is no longer where our feet are standing, it’s a rung up the social ladder. Our actions are embedded in our grand narratives. Our survival relies on a consensual response to our crisis. Who makes the product you buy? Who recycles the product you dispose? Build an adequate local culture. I left wondering. The new Jerusalem is a dream of the new world, with adequate housing, a just god, life-giving water and an endless supply of fruitful growth. It is also uninhabited, just out of reach, in the realms of potential. I am not certain I see the initiative and the dynamic response that could come from communities of faith. Those who do act remain isolated. The scale of change to the narrative remains overwhelming. 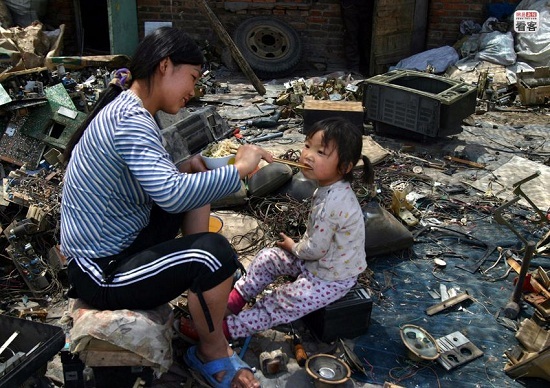 Lunch in Guiyu, China, where cell phones go to be recycled. This year’s peace lecture was given by Rev. 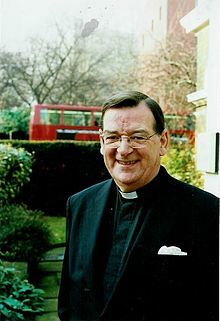 Dr Leslie Lord Griffiths, of the Methodist Church of Great Britain. He is a life peer of the British House of Lords. Is there are petition to have him released from this life sentence? I would sign it. The peace lecture presented by Dunedin’s Interfaith Abrahamite Council exchanges each year between Jews, Muslims and Christians. This year it was the Christians’ turn. Griffiths was in New Zealand was in New Zealand for the national interfaith conference in Dunedin, and he stayed on to do the peace lecture. As well he had a programme of speaking and preaching in New Zealand. Fans of Flanders and Swan should feel very comfortable with Griffiths’ accent. I did. Religious traditions can no longer contain themselves hermetically. They overlap. This creates an opportunity to become aware of each other, to appreciate each other with warm affection, to enjoy where we can have common witness and practice. Religion relates to a community of faith. God, whom we encounter as the stranger, transcends our identities, our labels. God does not love humanity — god loves each human individual. We are in an unstable age, as one Abrahamite religious tradition, Islam, enters its fifteenth century. Look how Christianity coped with its fifteenth century. It wasn’t pretty. The House of Islam is in the middle of this century with its rivalry of puritanic sects and moderates. Western nations standing to one side, behaving like a prejudicial baseball bat, the House of War, does not help. At the same time, in the midst of revolutions, it is the springtime of nations. People of faith, who share a god of peace, unite! I did not linger to enjoy the supper after the talk. The winter season is given my throat a touch of bronchitis and I really felt like opening a bottle of wine. Good display of ephemera from the 1915 Knox College Reunion ‘Somewhere in France’. Special reference was made Adam Madill, the Presbyterian Minister who resigned his charge to fight in World War I. He was killed in a raid on German trenches in France. There’s a date to keep for 2015 at the Castle, the centenary of that event. Troopship newsletters were produced by soldiers on their way to the front. They are an unexplored source of genealogical information. I wonder if any of my ancestors are mentioned in the collection.